Parked in the ballroom at the Chase Park Plaza, Respect Pro BJJ returned Saturday night to bring to St. Louis Brazilian Jiu Jitsu at its highest form. The evening was packed with elite grapplers from children to belts blue, purple, and brown to a whopping nine black belt matches all along with two mini tournaments. Respect is headed by the duo of Patrick Smith, a regional MMA originator in his role as president of Cage Championships, and Gracie Humaita St. Louis' JW Wright. "As a matchmaker goes I tried to put together a pretty good card and it surpassed anything I ever thought," Wright said. "You never know how it is going to turn out but to watch Rafael Lovato do his thing you understand why he is a world champion at black belt. It was good to see Tyler Bishop get out there and be aggressive and I think both tournaments had just great match after great match." Both submissions and and/or a points system determined the winners at Respect 3, where the regional jiu-jitsu community was housed under the stately roof of the Chase. Local black belt Kyle Watson, who competed in the previous two Respect events, stepped off the mat and behind the broadcast microphone for FloGrappling, who carried live coverage of the matches. Being at the ground floor and seeing the progression of the Respect BJJ brand and model (who had its first show in early 2015) had him celebrating the evening. "Every event is better than the next and the talent just grows and grows," Watson said. "People want to be on this card. They see what (Respect) is doing and it was stacked top to bottom. If you look, we had one decision and one overtime. Everything else was submissions. That's amazing. And even the ones that were submissions, they weren't blow outs. The intensity level keeps building and you see it from the beginning with the kids match. The females were fantastic. I love seeing the guys going for the finishes. There were some guys who were up by a significant margin but were still going for the finish and not just hang on for the win, even though I'm a staller at heart, I still appreciate the submission." The main event saw arguably the best American grappler currently competing in Rafael Lovato Jr out of Oklahoma taking on Illinoisan Steve Patterson. Lovato is only the second American ever to win the Brazilian National Championship, the other being BJ Penn. Lovato a huge favorite going into the match, did not disappoint winning impressively in the first four minutes of the match. St. Louis was well-represented throughout the evening. Notably, current Ultimate Fighter 23 contestant and contender Andrew Sanchez blew the dust and cobwebs off his gi and battled to a draw with Matt Leighton. At the black belt level, Nick Sanders pulled off the win over Alan Shebaro. Tyler Bishop, donning an American flag headband and sunglasses on the way to the mat, got the crowd on its feet with his walkout and eventual submission of Josh Mancuso. Ezra Lenon and Jarod Dopp put on one of the more exciting matches of the evening with Lenon, the Abu Dhabi veteran and a burgeoning name on the national jiu jitsu scene, getting the victory. Lenon has been a competitor at all of the Respect events. Dopp and Lenon have faced each other three times now with the pair going 1-1-1. "I was trying to keep it moving. I hope it was fun to watch out there," Lenon said. "He was pressuring hard from the bottom and I didn't want him to get back to his feet because he's a big guy and I didn't want him on top of me. A couple of times it was slow, but it was just me making sure he didn't explode back to his feet. It was good. He's a fun competitor. The (Respect) production has always been smooth and the show keeps getting better and better each time. It's a blast fighting on it each time. I really enjoy it." 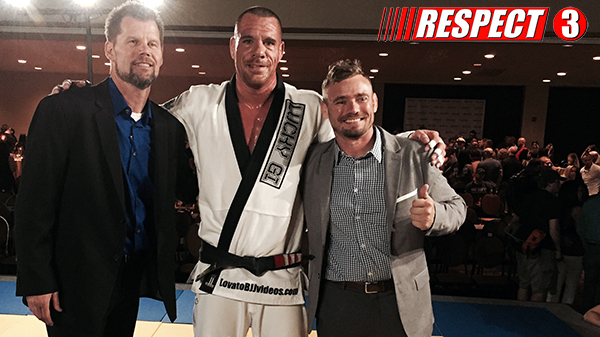 As Respect moves forward, Wright is fixed on giving prominence to BJJ in the Midwest. "We're out here in the Midwest, no one gives us any time and I hope the world takes notice at what kind of quality we had and what type of show we're trying to produce," Wright said. "I think it's all a learning curve. No matter how many shows you do you're dealing with different people every time and different venues. I think we found a home in the Chase Park Plaza. The fighters deserve a facility like this. I'm excited about the future and how we can help develop pro jiu-jitsu."